Collecting Asylum: Asylum Reviews; Riddled Corpses EX [Xbox One]. Being fans of the twin-stick shooter genre, Riddled Corpses EX looked like a fun new challenge to try out. It doesn't look all that different from the millions of other twin-sticks we've grown to know and love, but we were interested nonetheless. 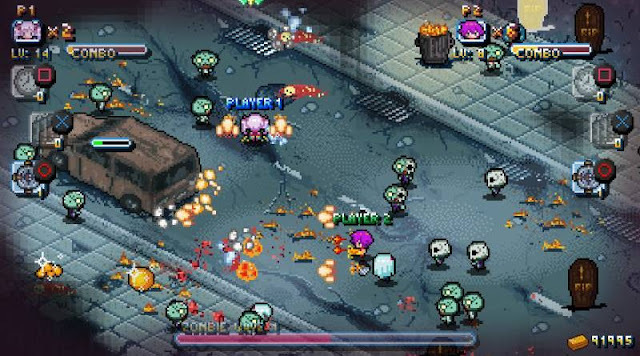 It's made in the style of 8/16 bit arcade games, so looks as you'd expect a post-apocalyptic zombie land to look. Both the story and the appearance are fairly generic, so we would have liked to see a little more originality, but it still satisfies that shmup/bullet hell itch. There are six characters to choose from, each with their own stats, abilities and guns, that you can upgrade as you go along with the gold you get through your runs. Three gameplay modes: Arcade, Story and Survival, mean that you have a lot of replayability - definitely a big pull for the genre. All three modes are challenging, and definitely stand the test of being difficult enough to make it a fun challenge, but not so difficult that it becomes too frustrating to play. Story Mode is where you play through chapter after chapter, very standard. 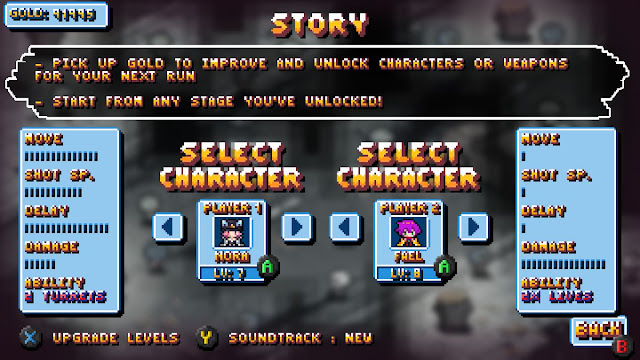 Arcade Mode is similar, but as you would in an Arcade, dying takes you right back to the start. And Survival is just an endless stream of enemies. The chiptune music is an ear-pleasing trip down nostalgia lane, and you can switch to the Classic soundtrack if you were a fan of the 2015 release. Different variations of gold scatter around the screen as enemies are mown down - larger pieces of gold (such as big piles of gold and ornate golden heads) of course reap higher reward - so be sure to pick up as much as you can, prioritising those. Lifesavings pick ups like dynamite that will blow up every enemy on screen, health packs to recover some health (a must have when precariously weaving in and out of projectiles while near death) and small clocks to slow time right down to allow you to readjust and take out enemies with ease are all essential in order to survive a run. In Arcade Mode there will occasionally be an icon that appears on screen pinging around quickly, and nabbing that will also get you a character/weapon upgrade. 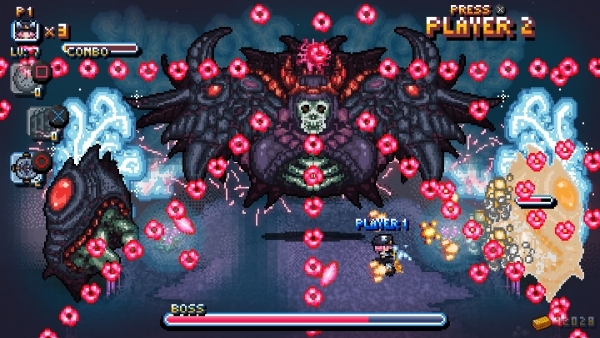 Quite often during battles, there would be so many projectiles coming from a boss, it would seem impossible to fit through any of the miniscule gaps. You'd take a sharp intake of breath with each pass through, unsure if this would be the time you'd get to meet your maker. The playable characters don't quite stand out enough against everything that's going on, so it's quite easy to get lost in the chaos. Also available in the game is couch co-op which is always a bonus nowadays - we just don't see it as much as we'd like to. This makes for a fun addition if you've got friends over. Our son is also a huge fan of the genre and he appreciates the assistance from Dad, too! 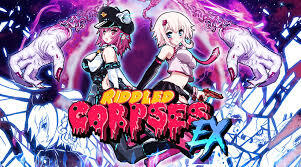 Have you played Riddled Corpses EX? What did you think about it?